THE RED TURTLE is a quiet, subtle, easy-going film. It is yet another variation on that tried and true notion of a man who washes up on the proverbial dessert island. There is food and water and places to take shelter, but the man nonetheless wastes no time trying to get back to civilization. Using the resources available to him, he makes a raft and sets out to sea, only to have his makeshift boat smashed to pieces. The culprit is the aquatic terrapin of the film's title, and each and every time the man builds another raft, the turtle breaks it apart before it gets more than a few yards from shore. One day, however, the turtle makes the mistake of coming on land. The man hits it with a large bamboo stalk and leaves it turned over on its back. The turtle apparently dies, and then apparently transforms into a woman. This female companionship gives the man a reason to stay on the island, and we watch their relationship as time passes, and the two eventually become three with the addition of a son. If one were to say that THE RED TURTLE is a sublimely beautiful work of art, it would be hard to argue otherwise. If one were to say that it is far too long, and frankly kind of boring, it would also be hard to argue otherwise. I can see both points of view, but I must confess to leaning more towards the less favorable assessment. Look, I'm as burned out as anyone on the seemingly endless stream of "family" animated features being cranked out by the major studio assembly lines. I love animation as an art form, and am very much open to its use for something other than kiddie fare. So I really wanted to like this movie. Had this been a longer short film, say about 30 minutes or so, it might well have been right in my personal "Goldilocks" zone. Long enough that it wouldn't have felt rushed, but not so long that the minimalistic concept starts to feel stretched. But that's not the route that writer/director Michaël Dudok de Wit chose to take. 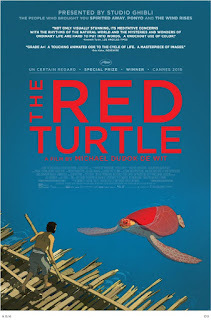 And even though he's on the short side of feature film length at an hour and fifteen minutes, by about the halfway point THE RED TURTLE was starting to overstay its welcome with me. Other, more patient viewers may certainly disagree, and even despite my eventual exhaustion with the film's languid pacing I still found aspects to appreciate, in particular the (mostly) hand-drawn animation and atmosphere of fantasy, but there just isn't enough here to sustain a feature film. 2 ½ out of 4 stars.